N26 is a good example of a new world trend, called The Mobile Banks. 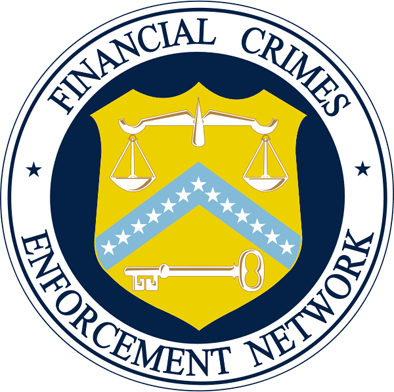 It basically means that the customers get to have all the accustomed features, safety, regulation and service of the regular big banks, but in a modern, lightweight, and handy digital form-factor of a mobile application. N26 was founded in 2013 by Valentin Stalf and Maximilian Tayenthal — young yet experienced business and finance experts from Vienna, with the goal to reinvent and redesign banking as we know it, to make it simpler, faster and up-to-date. They describe their mission as “reimagining the retail banking experience for today’s mobile lifestyle”. Having a fully online business model, N26 operates at a much lower cost, thanks to frugal organizational structures, no IT legacies and no expensive branch network. As a result of all those savings, N26’s customers are getting outstanding value for their money. Despite being a relatively new service, N26 has established partnerships with the top-notch financial companies such as TransferWise (foreign exchange), Raisin (savings), Clark and Allianz (insurance), Auxmoney (credit) and others, to be able to provide its customers with best & sterling products. Today N26 is called one of the fastest growing banks in Europe and has more than 1 million customers across 17 European markets and over 430 employees. N26 is a fully-licensed European online bank, with account management and all the features available in a mobile app or a web-version, which is still providing you with a real international debit card with free ATM withdrawals worldwide. It means that you can pay, withdraw money, block or unblock your card, set permissions or limits, and make other security changes — in other words, do everything you can do with a traditional bank, except easier & directly from the app or a desktop web-account. N26 has partnered with TransferWise so that you could do international transfers directly from the N26 App. It could be up to 6x cheaper than using traditional banks due to the mid-market exchange rates. N26 doesn’t charge fees on foreign transactions. There’s also no need to warn anyone that you are going to use your card abroad, as you still have to do with a regular bank. Instead, you just enable or disable foreign payments directly in your phone app. Up to five times per month, you are able to withdraw cash in Euros from any ATM for free, using the N26 Mastercard. Manage everything directly in the N26 app: set payment limits, lock your card, and send money to friends, all in real-time and in spite of your location. The app is also featured with instant push-notifications on all transactions and expenses statistics. Contactless payment systems allow users to pay without physically swiping a card: instead, you can just put it near the processing terminal, making them connect wirelessly. Another level is the online and mobile payments, when you don’t even need to have a card around: all your payment details are saved in your smartphone and your profile is connected to your bank account, allowing you to charge your bank account directly from the app or web pages. 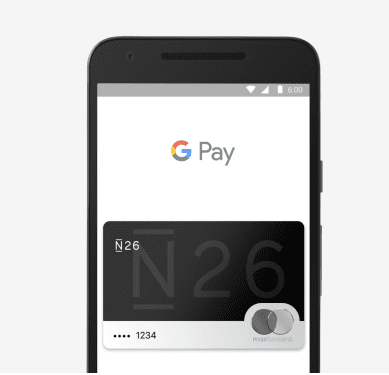 Google Pay is one of the most popular digital wallet platforms for in-app and tap-to-pay purchases on Android phones, tablets or watches. With the N26 bank account, you can withdraw and deposit cash for free at 9,000 retail partners across Germany. 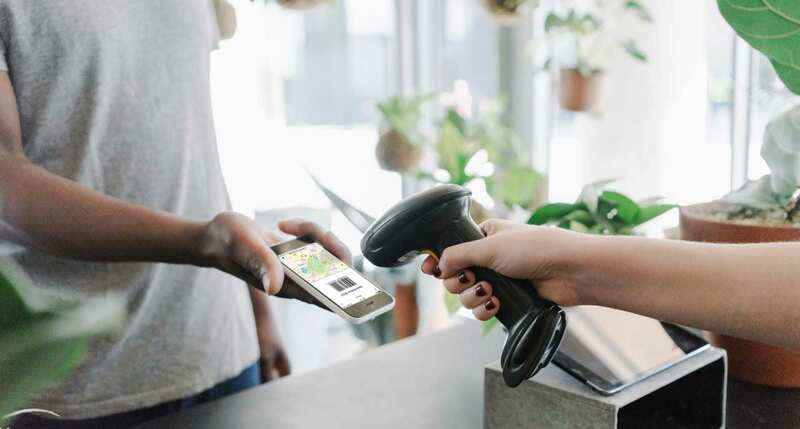 All without using your Mastercard: let a cashier in one of the retail partners scan a barcode from your phone and get cash right away for free. Same way you can deposit money to your account. Slovenia. The list of applicable countries is growing and is going to be updated with UK and US in 2019. The product is designed for individual users as well as freelancers and online-sellers and has custom features and different account types for both. A bank account in your phone, making sending money, managing your account and your savings and keeping your money safe — easy and available at your fingertips. A mobile bank account that is made for freelancers and small business owners (Doesn’t fit for enterprises). Get paid and earn on your purchases. Keep business and personal separate. Direct reinvestment with 0,1% cashback on all purchases made with your Mastercard. Sign up is fully online and gets you up and running in no time. As the N26 website claims, you can register and get your bank account ready in 8 minutes only. You basically just need to download the Mobile App, fill in all the personal details, read and agree to the conditions and order a card, which will be delivered to you by mail. It’s paperless & effortless, thanks to the eKYC authorization standard. * Plans, Services and Fees for everyone who registers with an address in Germany. Choose your country/region to see the relevant pricing and plans. Track your balance over time: You can look through all of your transactions to see where and when you’ve spent your money. #Tag your transactions: #weekend, #friends, #gift — You can create your own personal #tags to organize your transactions better. Automatic categorization: Get an instant breakdown of your spending. 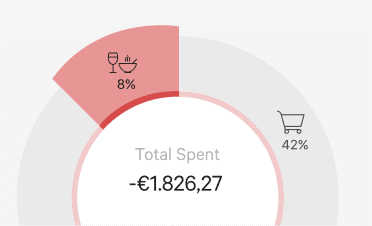 The N26 bank account uses artificial intelligence to automatically categorize your spending. Bank on the big office screen: WebApp has the same functionality, with easily exportable CSVs. Export your transactions: Download as a CSV directly on your phone or computer. In just a few taps you can make real-time transfers with N26. You can send, receive or request money from your friends instantly. N26 and their partners take safety very seriously and have an extensive set of technical and operational solutions to provide the customers with the piece of mind. You have full control over your account. Set and change your daily payment and withdrawal limits, immediately lock your card if it gets lost, reset your PIN, enable or disable online or foreign payments. You can customize your N26 Mastercard permissions and restrictions..
3D Secure (3DS) is an extra layer of security that helps prevent fraud when making payments online with your N26 bank account. It is called Mastercard SecureCode. Realtime account notifications. Get a push notification immediately after all account activity, including card payments, ATM withdrawals, direct debits, transfers. Instead of typing in your password every time you want to login to your N26 bank account, you can simply log in using your fingerprint. Every N26 bank account is guaranteed by the Compensation Scheme of German Banks up to €100.000. Our three-tier security procedure protects your N26 bank account and all your transactions. Your account can only be paired to one smartphone at a time, you must log in to your account using your password or fingerprint, and you must verify all online and offline transactions with your PIN. The N26 Bug Bounty Program offers cash rewards to encourage security researchers to inform us about bugs or vulnerabilities so that their technical specialists can fix them long before any damage is done. 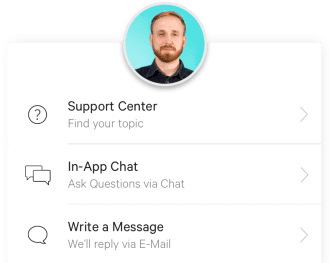 N26 customer support is available via in-app chat, email or over the phone. If you have any questions or run into any problems, the customer service team is ready to help you in English, French, German, Spanish and Italian. Also, an extensive FAQ knowledge base is available from within the App and on the website. Since its foundation in 2003 N26 has received over 5,000 5-star reviews in Google’s Play Store and Apple’s App Store, and most of the time users are pretty happy, especially stressing on how user-friendly the app is, how beneficial the product is for travelers and expats, and how easy, fast and seamless the money sending process goes. 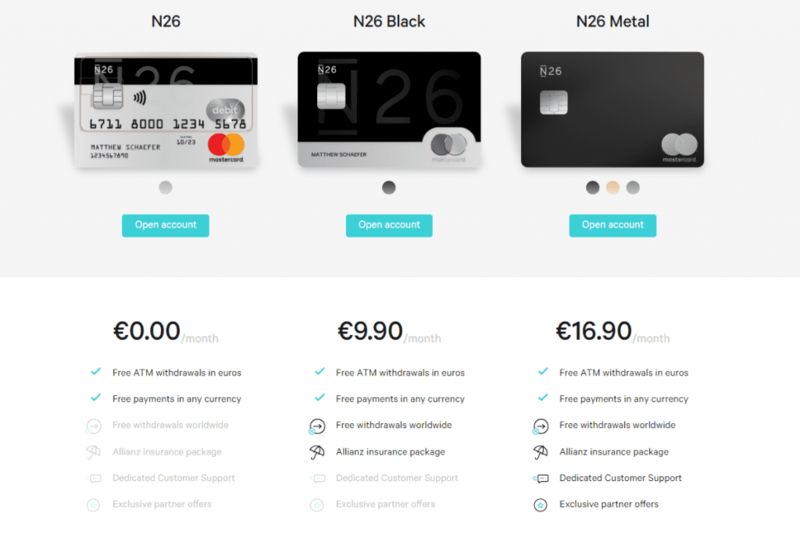 After carefully exploring the concept, the product and the features N26 is offering, we have to admit that it is very appealing and seems like a no-brainer: you get a fully-licensed modern European bank, with all the needed guarantees, insurance, and top-notch service providers as partners; no fees and fair mid-market exchange rates; lightning-fast transactions and a total control over your money as well as setup — and all that in your mobile phone. 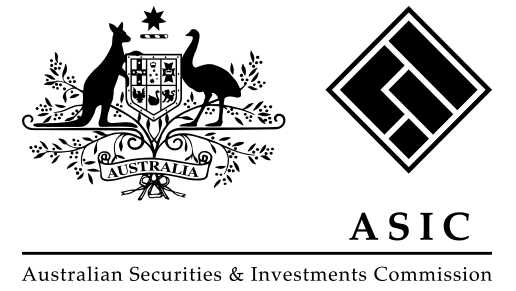 This probably is the true future of banking and a model we will be seeing more and more. Limited locations available at the moment and the overall focus on Europe in currency, partners etc.